This set from Ellen Hutson, designed by BestLaugherOnYouTube Julie Ebersole, is the perfect set for tags – especially for gifts from Santa, or for me – gifts I’m giving from Secret Santa! I decided to try something I haven’t ever done before – create a scene, but do so with embossing, and not with any coloring. Eeep! What! Check out the video below, or click HERE to see it in HD on YouTube! While working on these tags, I felt like saying “Look ma! No coloring!” But I suppose coloring with embossing powder is a form of coloring, right? Join me on Periscope sometime during the day – it’s Open Studio, so you can pop by anytime to check progress on an all-day piece! I love these tags. Heat embossing addso muc. Make A Wish! Make A Wish Foundation is my charity of choice! You have really inspired me to try more embossing you make it look easy and effortless. My Charity is Angels Among us Pet Rescue! More adorable tags!! Favorite charity is Mission Arlington! You’re so great at all you do! And you put your entire heart into it all. Thanks. 🙂 The National MS society… Capital chapter. Such awesome work as always. Thank you for sharing your creativity to help spark the rest of us. I love the charity idea as well. My charity is any that deal with children that have autism. 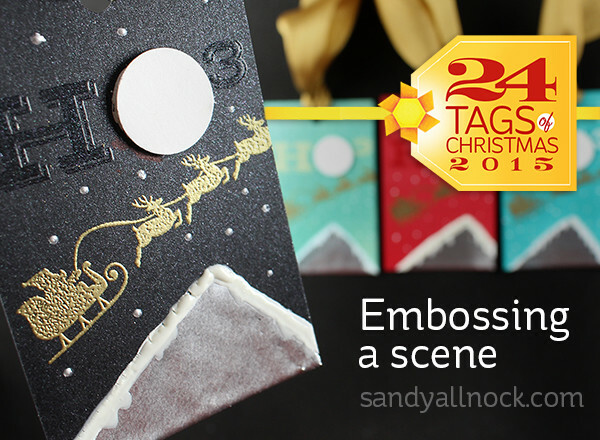 I love heat embossing – this is a great idea! My charity is Preemptive Love Coalition. Love the tags and the rooftop idea! One of my favorite non-profit organization is Buckeye Search and Rescue Dogs http://www.buckeyesardogs.org/ My nephew’s dog, Kyra, is on the home page! Cute tags! My charity of choice is World Vision. More beautiful tags–thanks so much! Today I’m going to mention one of my other favorite charities, the celiac foundation, as I have celiac disease, as does my Dad. Very interesting technique! Definitely must try it. My charity of choice is Developmental Disabilites Association. Who needs a house stamp when you have a stamp pad for a roof Thanks for the inspiration. My charity of choice is St Jude Children’s Research Hospital. So creative ….. the way you created the roof of a house….. like it!!! thanks for sharing. my charity is hospice. any hospice of your choice. they just do so much for our love ones at our time of need. Nothing like embossing and glitter at Christmas. Love this series. So many lovely tags…not sure which technique to start with when I start making tags…hmm I’ll need to try all. These tags are cute! Any charity for the Military Families or for Breast Cancer Research is my choice. Thanks for sharing! My family is grown and don’t do “santa” gifts anymore, but am liking the idea of doing up a design style for each family member this year. Thanks for sharing!! My favorite charity is Homeless in Seattle. Such a cute tag. I still like embossing, especially in gold. You just can’t beat it. My charity is Randolph ASPCA.